Products that are built to unrelenting standards in traditional, classic and modern contemporary designs ensuring a luxury and designer bathrooms have the best gold fixtures and fittings in the latest European designs. As a luxury brand, Livinghouse expects and provides the very highest of quality products, for designs that inspire and fixtures and fittings that are styled to last a lifetime. Amongst our gold tap range you will find that every one of our products featured is created from high carat gold - there's no makeshift precious metal to be found here, only real gold finishes. So come on in and take a look round at our collections, within which you'll find leading designs from Italy and Europe, including basin taps, bath taps, freestanding bath taps, with shower attachments wall mounted and 3 hole taps - with each having been subjected to our un-negotiating approach to design. We've taken care to source items that have our clients' tastes covered, whether they prefer traditional designs, or the most modern and contemporary. Flagship collections amongst our gold tap range include the modern Waterblade Gold Tap Collection, this gold waterfall tap range is for the home that is decidedly contemporary and that seeks to make a literal splash with the fixtures that adorn their bathroom. These are the products worthy of the most elegant of settings, creating a spa like atmosphere through gentle waterfalls cascading direct from leading designers. 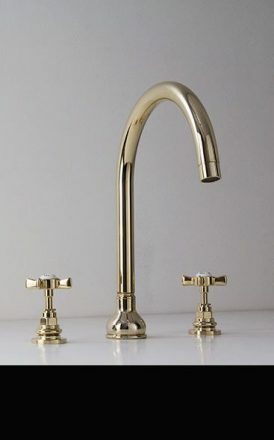 The Classic Gold Taps Collection and Coox Gold Tap Collection features taps of gentle, elegant lines and edges, where a traditional approach to design runs through our range, yet each has been brought into the modern world by some of the finest of Italian designers. Similarly to our other gold tap collections within this range there are further fixtures to complete your bathroom design such as shower valves, thermostatic valves and shower heads. 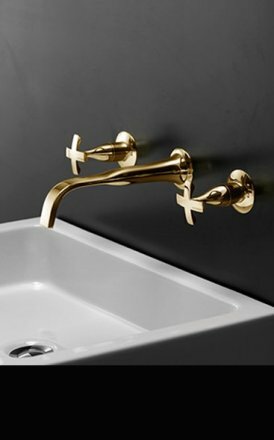 The Kara Gold Taps Collection completes our perfect package of taps, where the designs are wonderfully understated, yet seem to deliver optimum aesthetic impact. Under this particular designer name you will find a comprehensive range of items, from gold plated basin taps to gold shower heads and from freestanding bath taps to matching gold bottle traps all giving those added luxury features that a gold themed bathroom design requires and ensures every element within the bathroom is carefully considered and pulled together. Each of our collections presented here can be best showcased amongst our gold bathroom accessories collection - simply complete, comprehensive luxury. Products that are meticulously sourced, backed up by unparalleled customer service. We're passionately proud of our product collections, and we're even prouder of the level of customer service that we deliver. Our team go beyond being merely there to help with order queries, to provide essential style advice on making the most of your home and the spaces that you spend the most time in. So, whatever your question, query or need, we're here to help and we're only too happy to do so. Make the entrance to your bathroom as perfect as the room beyond it. Our gold door handles provide for the perfect finish for the bathroom that has been carefully considered when it comes to taps, shower head and everything in between. Just as the ranges you see before you here, our gold door handles range from cutting edge modernity to the gentle, sweeping lines that ooze elegance. This exclusive collection of Rose Gold bathroom taps contains stylish, modern tap and shower designs. Within this range you will find rose gold basin taps with wall mounted and deck mounted options; rose gold wall mounted, deck mounted and freestanding bath taps; along with rose gold shower fittings, including shower head and shower valves. Manufactured in Italy; all products in this range are made from solid brass with a high quality lacquered rose gold plating. A lovely collection of contemporary waterfall taps finished in a beautiful gold plated finish. These luxury waterfall bathroom taps include gold basin taps and bath fillers with matching waterfall shower heads and thermostatic shower valves. All gold finished taps are supplied to special order please allow 3 weeks for delivery. A superb quality collection of gold finished bathroom taps in a traditional Victorian design. This luxury range offers gold basin taps for wall mounting & deck mounting, matching gold bath taps for bath rim and walls, plus bath fillers with shower attachments & matching shower heads & accessories. All our bathroom fittings are beautiful European quality made in solid brass with a thick gold plating. All gold finished taps are supplied to special order please allow 3 weeks for delivery. A classically contemporary collection of gold bathroom fixtures and fittings. We can supply basin taps & bath fillers plus matching gold shower valves and shower heads, all in a high quality plated finish. 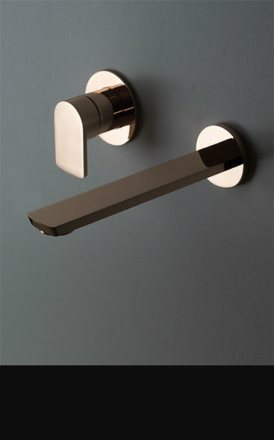 This designer taps range is designed and manufactured in Italy ensuring beautiful styling and high quality. All gold finished taps are supplied to special order please allow 3 weeks for delivery. A stylish collection of modern gold bathroom taps. Within this brand new contemporary collection we can offer wall mounted and deck mounted gold basin taps, freestanding and wall mounted gold bath taps and fillers as well as matching gold shower heads, manual shower controls and thermostatic shower valves.